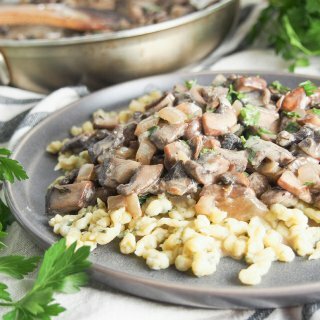 A vegetarian twist on the traditional stroganoff, this mushroom version is easy to make and full of flavor. Dice the onions and chop the mushrooms into small-ish chunks - I tend to halve the crimini then slice, cut the portabella into slices then into a dice. Melt the butter over a medium heat in a skillet/saute pan and add the onions. Cook, stirring occasionally, until softened, about 3-5minutes. Add the mushrooms and cook, increasing the heat if need be so they cook without becoming too wet. Once the mushrooms have softened, about 3-5min, add the flour to absorb the excess fat then add the stock, paprika and thyme. Stir to ensure any browning from the pan is mixed in then bring to a simmer and cook for 5-10minutes.